Hiya guys! First and foremost before I get into my post for today, I want to say I'm still dealing with a situation in my personal life that is causing a lot of anxiety for me. So if I seem spacey or have a few days off here and there that's the reason. I'll need lots of well wishes and luck, hopefully by the end of the month this will be resolved once and for all. I will definitely keep you updated! Now let's talk about the polishes because you guys have been going nuts ever since I shared a sneak peek earlier in the week. Today I'll be sharing the Overcast Mattes collection by CDB Lacquer! 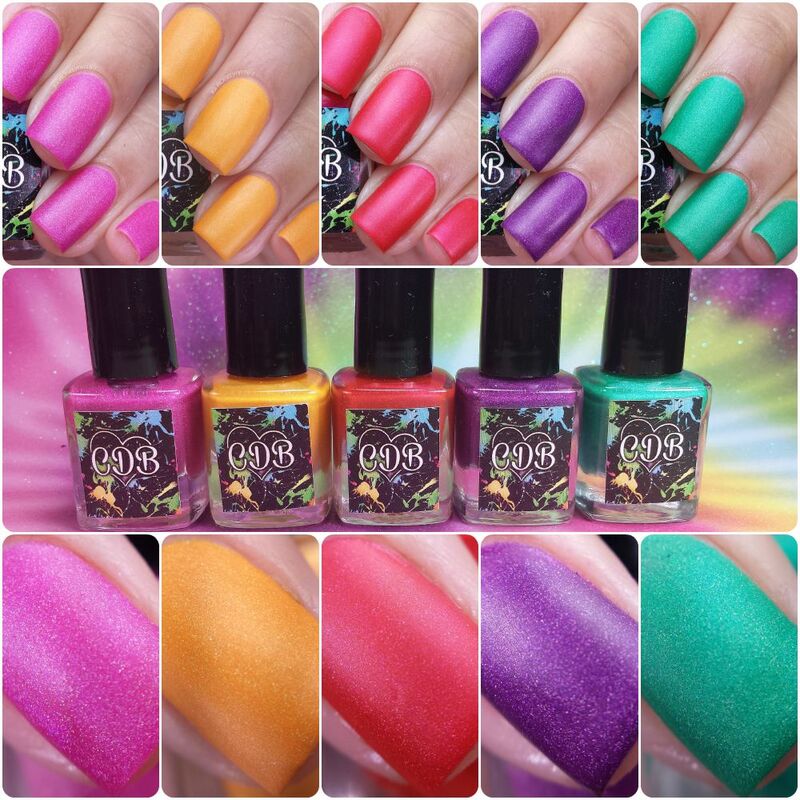 The Overcast Mattes collection by CDB Lacquer will be releasing this Friday August 21st at noon EST. 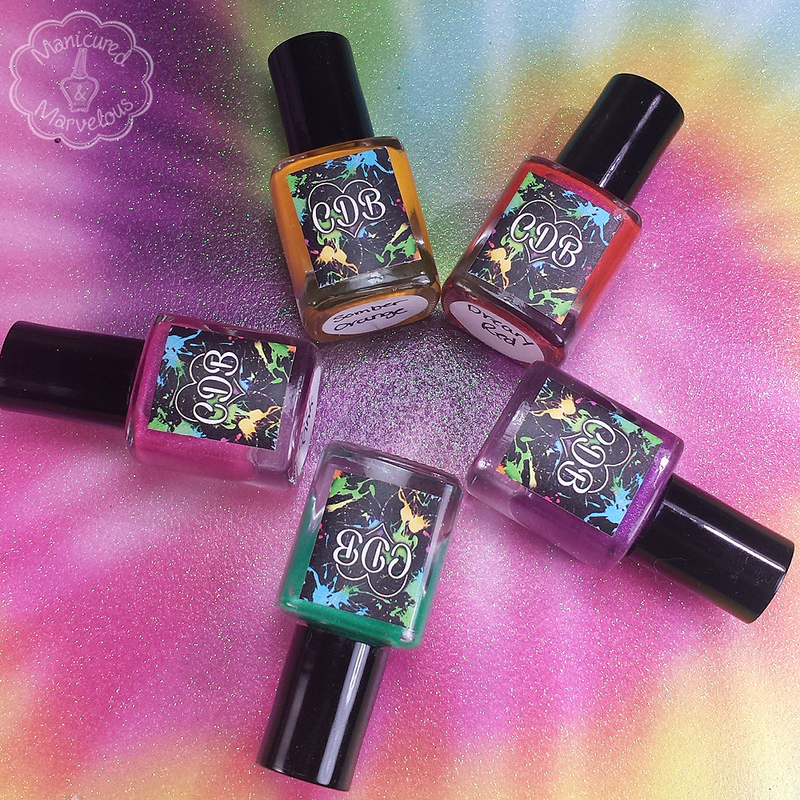 These polishes will only be sold in full size bottles for $7.50 each. 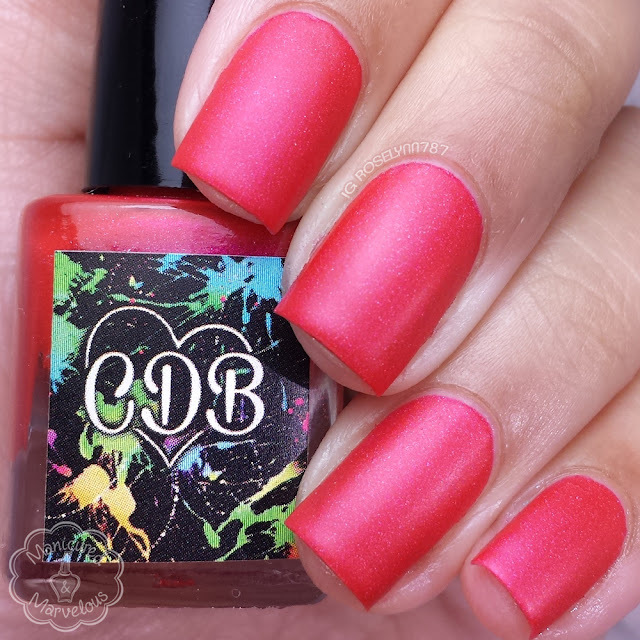 From Cheyenne, the creator of CDB Lacquer: "The collection is inspired from those cloudy days when everything bright has an overcast look and feel". 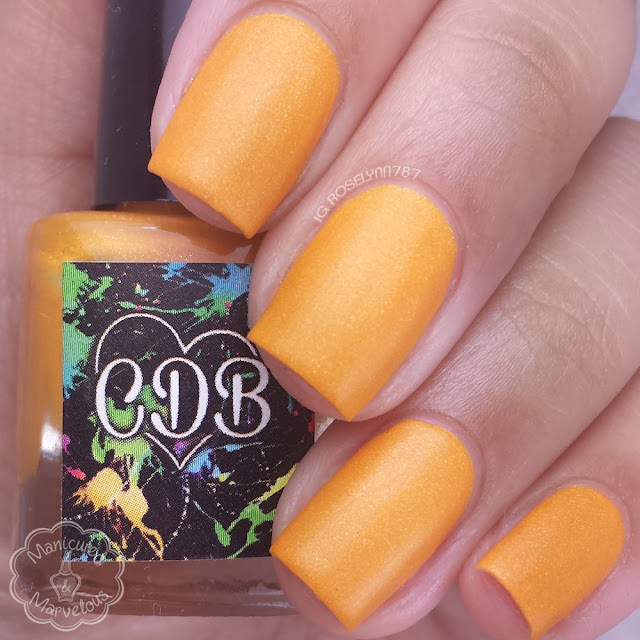 Somber Orange can be described as a bright yellow orange matte with silver shimmer. The formula was a little on the thick side and also a bit streaky on a first coat. It seemed to even itself out pretty well by the third coat. In comparison to the rest of the collection, this polish is slightly more textured and 'gritty'. Cheyenne has addressed these issues and the formula for the release batch will be similar to the rest of the collection. Shown here is three thin coats topped with an additional matte topcoat. Shady Purple can be described as a purple matte with silver shimmer. Definitely one of my favorites in this collection color wise. The formula was really great throughout and easy to apply. I had no issues with the build-up and although it appears to have a texture, it was a smooth finish. Shown here is two thin coats topped with an additional matte topcoat. 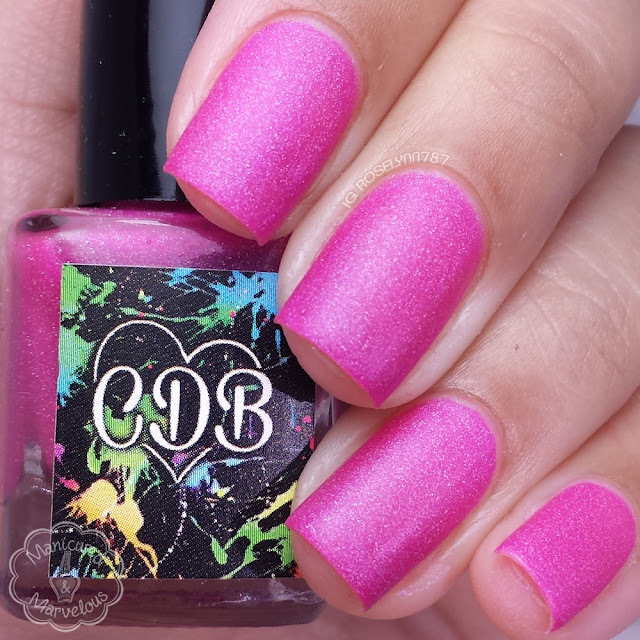 Hazy Pink can be described as a magenta pink matte with silver shimmer. I don't know if it's just me, but it reminds me of the skin from a marshmallow Peep, haha. I really fell in love with this shade after putting it on, the shimmer meshes really well and brings life into the color. The formula on this was similar to Shady Purple and had a great consistency. It was really opaque as well, which was surprising considering the shade. Shown here is two thin coats topped with an additional matte topcoat. Dreary Red can be described as a strawberry red matte with silver shimmer. The shimmer in this one is a lot more subtle than the rest causing it to have a smoother non-textured appearance. This is definitely another favorite of mine and if you're a fan of 'red' then I would say this is a must-have. Smooth formula, really opaque to the point of almost being a one coater. Shown here is two thin coats topped with an additional matte topcoat. Gloomy Green can be described as a kelly green matte with silver shimmer. At first I wasn't sure how I felt about the color against my complexion, but it has definitely grown on me. It just ends up feeling like such an interesting tone. Another smooth and easy formula with this one as well. It has that slightly less shimmer effect like the red one as well. Shown here is two thin coats topped with an additional matte topcoat. Overall this collection is a definite ball-park hit for me.The colors I think are the biggest draw in because they feel like a good farewell to summer and hello to fall. It definitely has that tinge of uniqueness to me. All these polishes do dry to a matte finish on their own, but for a smoother look it is recommend that you use a matte topcoat over them like I did. The formulas are really outstanding as well, which I wasn't expecting from a matte collection. What do you think guys? Are you on board the matte train? Wow. It's no secret I love mattes and these colours are all gorgeous! And I gotta agree with you, they are definitely great transition colours for Summer into Fall! I am loving this whole collection but my favorite is Gloomy Green. These are all great colors! What a cool idea for a collection. I hope life becomes more peaceful and easy for you soon! Thank you for reviewing these for me! Happy to hear you enjoyed them! Wow!! Love these. Something new and fresh with respect to matte polishes! I suffer with anxiety as well. I hope you're feeling better soon. Your swatches are quiet lovely! I like the looks of this collection. These are so pretty, and a brand I haven't tried before!! Thanks a lot! These colors really compliment my length! Wow, these are SO gorgeous! The purple and the green especially! These are all quite beautiful! I think your swatches captured them perfectly! ooh. I am actually in love with that green shade! Wow those are beautiful!! They look so smooth haha! Really loving Shady Purple and Dreary Red! I hope that things calm down for you soon because stress is so taxing. The macros killed me. I need one or all of these. I don't usually like mattes, but these are absolutely beautiful! Such good shades! Is it just me or have more brands been doing mattes lately? I have definitely seen the increase in mattes this year in general. Luckily so far I haven't seen too much dupes though. Really lovely mattes and beautiful pictures of them! These are super gorgeous and I love your swatches!